Today is the time to show one more ability of vlc media player that is you can easily play any of youtube video using vlc player. many of people using vlc player to play youtube videos because of many reasons, it is also a way to get rid of annoying youtube ads. Vlc player is a media player that has the ability to play nearly every type of media file, but its not enough for it, it has also more features that are secrets and many people don't know about it, as we already posted to use vlc player as a video cutter, are you don't know? 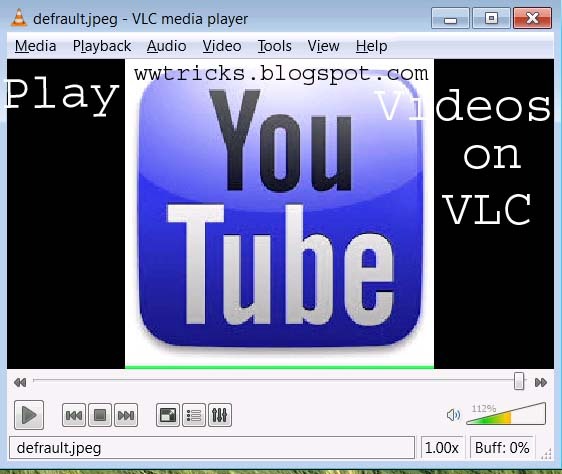 learn how to cut video using vlc player. change background music using QQ-player etc. But here we are going to show how to play youtube videos using vlc player,and it is very easy to watch youtube video on vlc player. Here's how to play youtube video on vlc? !. Launch Vlc media player. 3. Now a new window will pop up.So here in the address box you have to paste the address link for youtube video that you want to play on vlc media player. 4.Copy and paste it here and click on play (present in the right bottom). Now you can watch the youtube video video on vlc media player. 1:you don't need any flash player to install. 2:You can choose Video to "Always on Top" inside VLC and the YouTube video window will stick to the foreground while you work on other tasks. 3.you can also take a snapshot form the particular video. 4.You can change the Playback speed of the YouTube video and make it run slower or faster than the normal speed while watching it on youtube their will be no option. 5.And the one good is that their will be no ads.so you can play youtube videos without any ads. Isn't this enough? I checked it... And its working.